Business applications that use the data collected from the things and sensors in the field. A communications layer to move the data into to the data center. An Edge network that communicates with a thing or sensor. Most of the enterprise organizations are focused on the top and bottom areas; the applications and the things. Common use classes are predictive maintenance, real-time market insights, or product customization. One of my customers is collecting over 1B rows of sensor data per day. They are short rows, but a lot of them. They know the sensors well. They also know what they want to do with the data. Sogeti’s job is to help achieve those goals. The big question that is often missed; “How am I going to manage all that data for transfer back to my database”. Vendors are addressing this issue now. Cisco and Aruba have great networking solutions to ensure robust connectivity that is highly-secure. There also small, ruggedized servers from Dell and HPE that can run at “The Edge” to process the data received in a variety of protocols to process data at the point of collection. This has the additional benefit of supporting more sensors and saving bandwidth across the network. Regardless of industry, the promise of IOT is ultimately a move towards digital transformation for better, more proactive decision-making and to deliver a better experience for customers. To achieve those goals, at scale, we need to make sure we design and develop for all four layers. 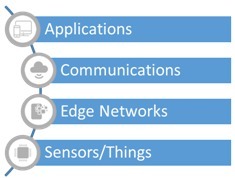 Add edge computing and secure networking to your IoT planning today.